Bicycle-Powered Haberdasheries of the World, Unite! outside of the human timescale. Leslie Shows’ strong attachment to geology finds its way into all of her works. Her work is difficult to classify; hybrid paintings originating in the landscape tradition, blending materials and layered portions in collage-like processes. The evolution of her work has moved further and further towards abstraction, removing many overt symbols or figures; adding deeper levels of layering and materials to become more elemental and atmospheric using forms such as icebergs, batholiths, caves and rock faces buried under large striations of color and material. Split Array features new work, loosely conceptualized around Fool’s Gold (iron pyrite). Using large sheets of polished aluminum Shows layers paint, glass and mineral fragments, and scans of a chunk of pyrite. Each piece uses a different face of the mineral as its starting point. The materiality of the mineral faces and subsequent layering and striations add to the already distorted immanence that the polished surface provides. The reflective surface forces viewers to place themselves within confusing geologic contexts. Following the pyrite theme, Shows created sculptures from caked sulfur, molding it into different forms and scattered it along portions of the gallery’s floor. Most of the forms are consumer electronics, remotes and video game consoles, children’s objects such as water guns, model rockets, and beach toys. The sulfur is fragile and many of the pieces crumble and dissolve into one another. Additionally, Shows includes a video piece, a narrative about coming to terms with the Other, described as a supernatural presence. The benign ghost story is coupled with interior photographs and odd reflective surfaces. In a loose way this piece relates to the distorted image of the viewer that is presented when one stands in front of the work. There are two ideas at work in Split Array, though both are subtle. First is that value is something that is fragile and tenuous. Pyrite gets confused for gold because people’s irrational desire for material wealth sometimes distorts their perception. Secondly Shows puts us in a position radically outside of her subject matter. Geology can be understood scientifically, but cannot usually be identified with in a personal way. Viewers do not see themselves in her landscapes and cannot romanticize them in the way that traditional landscape painting allows for. The paintings are visually interesting although the materials seem less important conceptually then for the high production value they provide. The video and sculpture are interesting exercises at connecting an abstract subject to different mediums but the mineral materiality is the biggest takeaway available in Split Array. Leslie Shows, Split Array at Haines Gallery until December 24th, 2011. What we can Learn from Pop-Ups about the Micro and Temporary. 2011 was the year of pop-up everything: from food carts to pop-up galleries to temporary storefronts, see these forms of business were more popular than ever over the past year. Couple these tendencies with the Occupy Wall Street’s highly-visible tent towns and there appears to be a movement towards the micro and the temporary. What, if anything, do these temporary micro-enterprises have to offer and what do they lack? Unlike many businesses who strive to become lasting or even institutional, these examples are not built to last. Do pop-ups signal a new way of doing business. Are they an independent alternative to conventional or online retail; a marketing gimmick like guerilla advertising and street teams; interventions into the urban fabric, or something else altogether? Many of these practices are now folded into the umbrella term tactical urbanism1 which indicates that there is a partial framework for understanding them. This statement raises the question of what is a micro-enterprise. Is it something that works symbiotically with its host body (SFMOMA in Syjuco’s case) or is it something that is more parasitic? In October, a pop-up bookstore called Scanners Project3 appeared on San Francisco’s Valencia Street. The store itself was around for a month. Scanners, in its brief existence, sold mostly art and counter-culture books and hosted a series of excellent lectures about books, collecting, and culture. The project was funded primarily by grants and was curated by an artist and a writer. Scanners itself was considered an artist-project. The selection of books, the presentation, and the environment created were all part of the art, but the store functioned like and indeed was a bookstore which, unfortunately, was only around for a limited time. Pop-ups range from the artistic enterprises above to whole neighborhood re-development schemes. Starting in December, the Pop-Up Hood appeared in Old Town Oakland. 4 The project was initiated by artist Sarah Filley and restaurateur Alfonso Dominguez describing it as, “a small business incubator revitalizing neighborhoods, block by block.” With the blessing of the City of Oakland, business associations, and local developers, a handful of store fronts were renovated and offered up, rent-free, for six months to small crafty enterprises with the hope of attracting more business to the neighborhood. 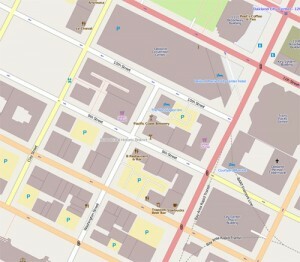 Old Oakland is the area directly south and west of the Convention Center and the 12th Street/Civic Center BART Station, comprising of 8th-11th Street between Broadway and Clay. While not entirely a forgotten ‘hood, Old Oakland is definitely under-utilized. The pre-existing businesses include: two upscale bars, two sports bars, a handful of restaurants, a few architecture firms, a coffee shop and a commercial grocery store. There is little draw for outsiders to visit the neighborhood besides the handful of bars and restaurants and the Friday Farmer’s Market. The Pop-Up Hood consists of a small selection of carefully curated vintage shops and local crafts. The shops are austere and built with the cheap, artsy assemblage, salvage work that is becoming the standard of hip décor skirting the line between commercial space and art installation. Time will tell if people going to pay $3 for a pack of vintage matches. How many hand-crocheted beer cozies or paper-masks of famous Minimalists will people buy? Whether or not these particular businesses succeed is irrelevant since these ventures are experiments done with partial funding of the business district to get more people to Old Oakland. Crafty artist run consignments shops are fun to look at but do not provide enough incentive for the average consumer to want to come back to Old Oakland again and again. The Pop-up Hood fits into the City of Oakland’s push for a “shop local” brand like the successful Buy Olympia and Shop Portland 5 among others. With the efforts of groups like Walk Oakland, Bike Oakland, and Oaklandish, there is growing effort towards branding The Town as hip, fun, and artsy. Oaklandish started as a pop-up, selling t-shirts and promoting events from its bus, appearing at farmers markets over the past few years and recently helped to open a storefront on Broadway and 15th. There are many parallel efforts pushing for innovative urban experiments and “revitalization” projects to change the perception of Oakland being a rough and tumble city. Another part of changing Oakland’s image has been the growing support for food trucks and street fairs. Oakland City Council has been agonizing over food truck policies to regulate mobile food services. Like pop-ups, mobile food services are appearing everywhere with increased frequency. The new generation of food trucks offers everything from flatbread sandwiches to Korean BBQ tacos, Belgian waffles, vegan Filipino plates, Irish-Eritrean 6 , and cupcakes. What they lack in permanent fixed address they make up with innovative food choices, growing customer bases, and strategic use of social media. But the flexibility of food trucks frightens some restaurants because they fear the increased competition, especially during events like Art Murmur which bring in additional customers. Advocates for food truck dining see this increase as a force that can diversify the urban food palate. Traditional street food purveyors like paleteros, hot dog, and tamale vendors know that mobile food vending has its benefits and drawbacks just like any business. 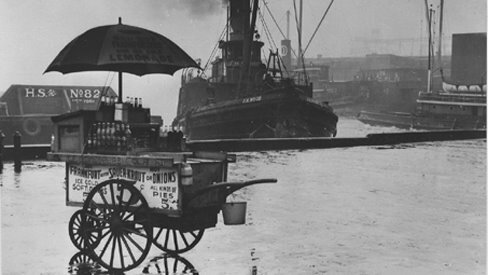 A pop-up shop, bike cart, food cart, or business in a suitcase is not a new or novel idea. Informal and small scale retail happens all around the world. Street vendors are always a part of the economic landscape and the informal sector is becoming an increasing part of global economic flows. 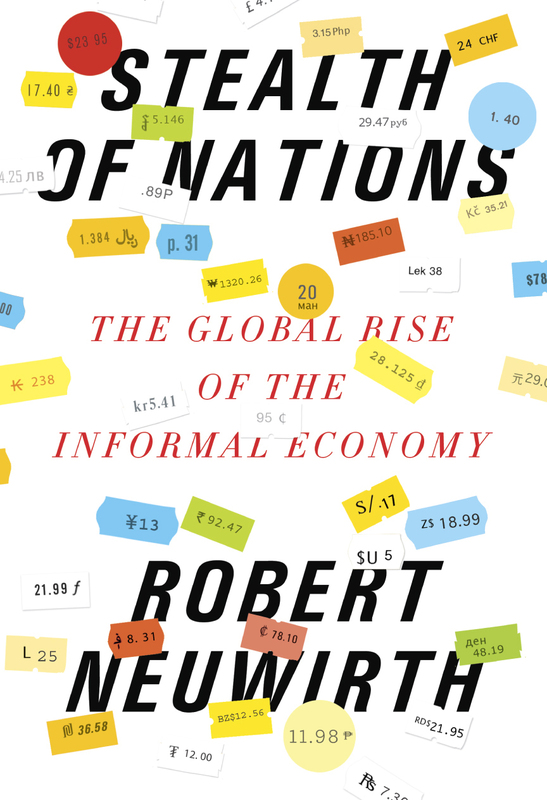 Robert Neuwirth’s Stealth of Nations: The Global Rise of the Informal Economy7 addresses this phenomena in great detail. For the book, Neuwirth spent four years getting to know street merchants from New York City to Lagos, Nigeria and other spots around the world. 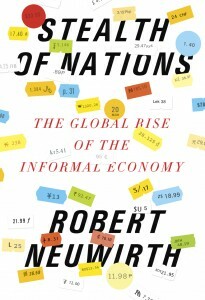 Neuwirth paints an empathetic picture of people’s business ventures and survival strategies, many in places where formal infrastructure does not exist. Informal business is increasingly just how business is done, particularly in places without readily available capital investment or stable governments. Pop-ups can be understood as a model of the temporary. The here-today gone-tomorrow, flexible, no-or-low overhead business or project is a part of the emergent economic reality. However there is a chasm between a cart at market in Lagos and a cart at a street fair in Oakland. And although there are differences between a pop-up as artistic practice functioning within an art-context and a temporary handicraft store envisioned as a re-development project, these spaces become a survival tactic for artists. However similar they may appear, a small business start-up has different goals and intentions than a critical art practice. It should be acknowledged that regardless of form, many people are using these craft businesses to sustain themselves, even though cottage industries can rarely replace the stability of regular employment. Another, probably less obvious problem here is what continues to be called the pop-up (and many of the tactics of tactical urbanism) are mostly limited to the young, middle class entrepreneurs. The second set of above examples, reflect a counter-culture using its energy towards re-development goals or conversely developers using counter-culture as a vanguard of gentrification. Food carts reflect a greater diversity in both owners and patrons, and contribute to this process to a far lesser extent. There is nothing inherently wrong with using city funding to launch an arts project or small-scale enterprise but it needs to be tempered with a critical understanding of how one’s project relates to its environment. Access to funding and space is more complicated than ever, but these businesses are of interest to certain a class-composition and target audience that does not always reflect the interests and needs of nearby residents. The rising popularity of the pop-up model also points towards the precarious state of the general economy. Lower overhead and risk becomes appealing when things are uncertain. Sharing spaces between multiple projects, forgoing fixed address, or bringing on tenants lowers the risk further. But this does not signal a new form of sharing or sociality or communization. There is little about a temporary model that resists business as usual. It is business as usual and certainly not something that is anti-capitalist. The format of mobile services could just as easily be used by the Gap or Victoria’s Secret as it could be used by artists. Many of these practices are not urban interventions, not in the way they think at least, but are forms of commerce with all the attendant precariousness of the present. SF Weekly. “Eire Trea May Be the World’s First Irish-Eritrean Food Truck” February 2nd, 2012.